My relationship with sprouts has not been an easy one. As a vegetarian, I’m always into trying new vegetables. But me and sprouts never really got along. They were always just a bit too “grassy” for me. That animosity has slowly begun to change over the past year, thanks in large part to Jimmie John’s #6 Vegetarian sub, which is liberally stuffed with sprouts. I used to pick them all off. And then…I started leaving a few on. And then a few more. And now? Bring ’em on! I’ve been buying sprouts at the grocery store. But, I spend $1.65 on them every time. And then yesterday, I had a classic Eureka! moment: I could grow sprouts at home. I’d save money, and have them readily available whenever I wanted them. Growing sprouts is pretty easy. And the cool part? There are tons of different seeds and beans you can sprout yourself. Sprouts are loaded with dietary goodness. For instance, alfalfa sprouts (the kind that are on the Jimmy John’s veggie sub) are loaded with antioxidants . Clover sprouts have tons of isoflavones, which have cancer-fighting properties. Mung bean sprouts are high in fiber, protein, and Vitamin C. And radish sprouts? They’re loaded in vitamin’s C and A, and they have 10 times more calcium than a potato. Yes, sprouts are good for us. The cool thing about sprouts is that there are several different varieties, all with a slightly different flavor. Alfalfa sprouts- These are the most common sprout. They have a slightly nutty, grassy flavor. Radish sprouts- Just like you might expect…these are spicy! Bean sprouts- You’ve likely seen these in the last stir fry dish you got from your local Chinese restaurant. 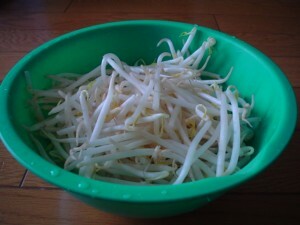 Bean sprouts are commonly used in Asian cooking, and they’re delicious when lightly cooked. Onion sprouts- These sprouts give you an oniony taste without the tears. Mustard sprouts- Another spicy variety. Soybean sprouts- Another nutty sprout that’s really high in protein. There are more sprout varieties, but you get the picture. When it comes to sprouts, we have choices. Before you go to bed, measure out the correct number of seeds you want to start sprouting, usually 2-3 tablespoons. Look for any broken or wilted seeds, or any dirt clods. Pour them into your glass jar, and then cover with them with 2 inches of water. 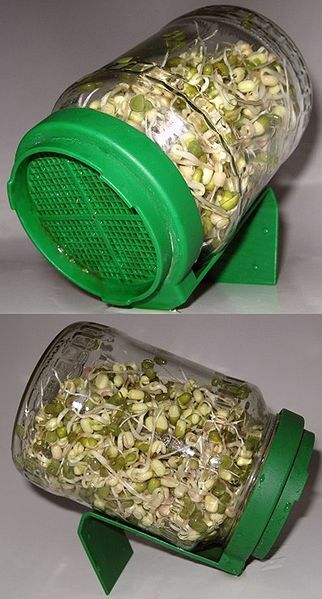 Put your sprout jar in a warm place (55 to 70 degrees) with access to indirect sunlight. Medium-sized seeds will need to soak 8-12 hours. Larger bean seeds will need to soak for 12-24 hours. This is why it’s best to start at night. The next morning, attach your screened lid to the jar and drain all the water out. Shake the jar well, and make sure that the old water is entirely out of the jar. Fill the jar back up with water to rinse the seeds, and drain it again. Tip: This water is full of valuable nutrients. Save it and give it to your houseplants. Or, you can even add it to a fruit shake and drink it yourself. To make sure the water is completely out of the jar, you can leave it upside down in a shallow dish for the day. Keep in mind that any sprouts that sit in water are going to rot quickly. Standing water is not your friend in the sprouting process. That evening, you’re going to repeat the process. You’re going to fill up the jar, shake very gently, and then drain it completely. You’ll do this morning and evening rinse and drain routine for 4-5 days. If it’s summer time, or the air is particularly hot, you’ll need to rinse and drain up to 4 times per day. After 4-5 days, you’re ready to harvest your sprouts. Now, different varieties will have different harvest times, so check the package of whatever seeds you’re sprouting. Then, they’re ready to eat! Do any of you grow your own sprouts? Have any tips you’d like to share for novice growers like me? If so, please write them in! Where do you get the sprout seeds? Bobbi, you can order them on Amazon. Or, I’d imagine your local health food store might sell seeds for sprouting. I think I’m ordering mine online (through Amazon) because their selection is awesome, and they’re organic. I’ve just started sprouting again. I love that you can grow your own fresh veges in a few days. The only problem i’ve had is seeds going mouldy in hot weather if I don’t rinse them enough. So if its going to be a hot day and i’m out of the house all day i’ll put the sprouts in the fridge for the day. p.s I’ve jst doiscovered your blog and am loving it so far. Off to explore more. Is that a special jar you ordered for sprouting? I’ve been looking for a product that I would like to purchase that is designed for sprouting. I tend to lose things like cheesecloth, screens, etc. and I would like a permanent fixture if possible. Could you advise where you got that jar from? Thanks! – if you could send me email it would be greatly appreciated! I’ve wanted to try sprouting for a while but I thought you had to have a bunch of special equipment. Your system sounds really easy! I’m with the previous commenter: where did your cool sprouting jar come from? Tricia and Ananda, The sprout jar pictured in the article is available through Amazon.com. It’s pretty cheap ($11 I think?). Sorry it took me so long to get back to you on that! Somehow I didn’t even see these comments come in.